With over 5,150 built-in songs, you can enjoy the widest repertoire of songs from Newest Hits to Party Favorites, Duets, 90’s, 80’s, and All Time Hits for all ages. Gives you dual professional wired microphones and user friendly remote control for easy navigation. All songs are in new high-definition sound powered by Dream Sound Module from France, with back up singers and real live instruments, empowering you to sing more encores! A smart compact and lightweight design so you could easily bring it on the go! 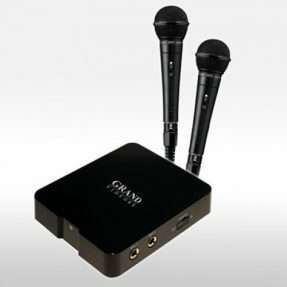 Supports up to 32GB SD Card to record your singing performances, personalize backgrounds or play your own karaoke videos! How mich os dat of if i pay for 8 months?how much is the down payment and what isthe requirement? (No) in-house installment plan for this item. Cash or credit card only. Please check if your credit card allows installment.